What are e-cigarettes? What is "vaping"? What are the side effects of e-cigarettes? Are they safe? Do e-cigarettes expel secondhand smoke? Do e-cigarettes cause "popcorn lung?" Do e-cigarettes help with quitting smoking? Are e-cigarettes regulated by the FDA? E-cigarettes (e cigarettes, or vaping) are smokable, refillable or replaceable cartridges or containers that hold liquid that contains nicotine, solvents, and chemical flavors. When a person inhales ("vaping"), they are putting a negative pressure on the device that triggers a battery to heat the liquid solution, which is then atomized into inhalable vapor. Depending upon the cartridge, it may contain no nicotine or up to about 16 mg nicotine. One container or cartridge has enough fluid for about 250 "puffs." However, nicotine concentrations and fluid volumes plus the compounds in the fluids can vary, depending upon who makes the e- cigarette. An e-cigarette has three main parts 1) a rechargeable battery, 2) a vaporization chamber/atomizer, and 3) a liquid cartridge usually containing nicotine, chemical flavoring, and other compounds. When you inhale on the tip of the e-cigarette, a valve opens to allow some fluid into the vaporization chamber/atomizer. The battery then heats the liquid, which vaporizes it, and then it is inhaled into the lungs. It is not known how safe or how unsafe these products are. Nonetheless, nicotine is considered to be very addictive, and that seems to be a cause for concern. Low doses may cause nausea, vomiting, abdominal pain, and eye irritation. High doses of nicotine may cause tachycardia, high blood pressure, seizures, coma, and death. Moreover, the FDA reported detecting ethylene glycol in some of the e-cigarettes and cancer-causing substances called nitrosamines in others. In addition, some e-cigarettes have caught fire and/or exploded because of faulty batteries or malfunctioning battery chargers. It took several decades to determine problems associated with tobacco use. It is likely that it will also take some time and study to determine how safe (or unsafe) e-cigarettes are. 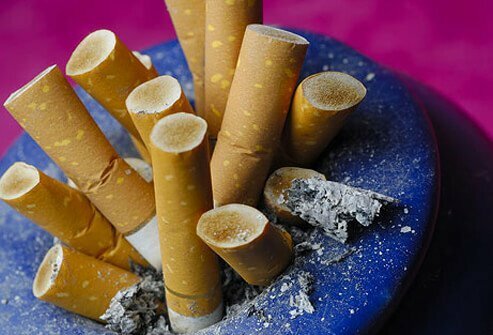 Experts claim that in order to stop cigarette smoking, it is probably better to use studied material such as nicotine gum, nicotine patches and/or counseling than to use e-cigarettes. They also suggest people do not start smoking e-cigarettes for fun or for quitting any tobacco products. The CDC published a report about the number of calls to poison centers involving e-cigarette liquids containing nicotine. The proportion of calls to poison centers increased from 0.3% in 2010 to 41.7% as of February 2014. The bulk of these calls are related to small children that open the liquid nicotine containers. The liquid nicotine containers are not childproof; they appeal to young children because of the candy and fruit flavors. They can cause vomiting, and eye irritation. Hookahs vs. Cigarette Smoking: Which One Is Safer? Not much is known about the secondhand "vapor" that is expelled from users, including levels of nicotine, nitrosamines, and other components that are yet to be identified. Nevertheless, many people would prefer not to be in a restaurant or other place of business and be exposed to vapors that contain addictive nicotine, and possibly other products that have a potential for harm. “Popcorn lung” (bronchiolitis obliterans) is a lung disease that results in scarring and narrowing of the airways in the lungs. The disease was linked to a chemical, diacetyl that provides flavor to microwave popcorn. This compound and others that are similar, when inhaled, causes high risk for this disease. Researchers found that 92% of e-cigarettes studied had at least one of three different compounds known to cause popcorn lung. Although long-term studies are absent, the American Lung Association considers e-cigarettes to be a dangerous risk factor for popcorn lung. Although e-cigarettes have been touted as a way for tobacco smokers to kick their cigarette habit, e-cigarettes in one study were only about as effective as nicotine patches. There is some concern that e-cigarettes are being marketed to attract younger non-smokers with "flavored" liquids such as bubblegum, piña colada, vanilla, and others. Because most e-cigarettes contain nicotine, it is possible that people can become addicted to them. Some doctors are concerned that if they become addicted to the nicotine in the e-cigarettes, it may be an easy step up to smoking tobacco, which is associated with so very many health consequences. Since this product was first developed in 2004 in China as a tobacco cessation device, it has grown rapidly so that in 2013 the estimated market is about 1.5 billion as compared to 100 billion for tobacco sales. However, the sale of this product is growing rapidly worldwide. The CDC suggests that as more people utilize e-cigarettes, the dramatic increase in nicotine poisoning in children will continue if nothing is done to prevent young children gaining access to nicotine-containing liquids. According to the FDA, over two million middle and high school students were e-cigarette users in 2016. As of 2016, the FDA now regulates the manufacture, import, packaging, labeling, advertising, promotion, sale, and distribution of ENDS (electronic delivery systems, such as e-cigarettes), including components and parts of ENDS (not including accessories. The American Lung Association is urging the FDA to require that diacetyl and other harmful chemicals be removed from e-cigarettes (removal from the fluid accessories). American Lung Association. "Popcorn Lung: A Dangerous Risk of Flavored E-Cigarettes." Updated: Aug 09, 2017. FDA. "Vapes, E-Cigs, Hooka Pens, and other Electronic Nicotine Delivery Systems (ENDS)." Updated: Nov 21, 2017. McArdle, Megan. "E-Cigarettes: A $1.5 Billion Industry Braces for FDA Regulation." Bloomberg. Feb 7, 2014. "New CDC study finds dramatic increase in e-cigarette-related calls to poison centers." CDC.gov. Apr 3, 2014. "Vaporizers, E-Cigarettes, and Other Electronic Nicotine Delivery Systems (ENDS)." FDA.gov. Updated Oct 5, 2016. Please share your experience with e-cigarettes vs smoking tobacco cigarettes. What are your thoughts about the secondhand vapors expelled by e-cigarettes. Have using e-cigarettes helped you to quit smoking? Chronic bronchitis is a cough that occurs daily with production of sputum that lasts for at least three months, two years in a row. Causes of chronic bronchitis include cigarette smoking, inhaled irritants, and underlying disease processes (such as asthma, or congestive heart failure). Symptoms include cough, shortness of breath, and wheezing. Treatments include bronchodilators and steroids. Complications of chronic bronchitis include COPD and emphysema. Popcorn lung is a term for the lung disease bronchiolitis obliterans. Popcorn lung is caused by diacetyl and 2,3-pentanedione, chemicals used when manufacturing flavorings for food certain products like popcorn, coffee. E-cigarettes also may cause popcorn lung. Diacetyl and 2,3-pentanedione damage lung tissue that is irreversible. Symptoms of popcorn lung develop gradually over time. The main symptoms are chronic cough and shortness of breath. Other symptoms may include night sweats, weight loss, and fever. Symptoms of severe exposure to diacetyl and 2,3-pentanedione include inflammation of the skin, eyes, nose, and/or throat. Popcorn lung often resembles tobacco-related COPD (chronic obstructive pulmonary disease) so it often is difficult to diagnose. Lung biopsy and surgery may be necessary. There is no cure for popcorn lung. Life expectancy for a person with (bronchiolitis obliterans) depends upon how early the disease was diagnosed and level of exposure to diacetyl and 2,3-pentanedione.